A third of the children at the Walden Lab School have autism and benefit from playing with typically developing peers. A red fire truck and crackers with grape jelly are more than just diversions to keep students happy at the Walden Lab School. They’re also educational props for the staff, who rely heavily on “incidental teaching” in the preschool’s four classrooms to engage the children and encourage interactions. The fire truck sparks a conversation between a curly-headed boy in a cowboy hat and his animated teacher about the color red, the purpose of fire engines—and sharing, after another child makes a grab for the shiny toy. 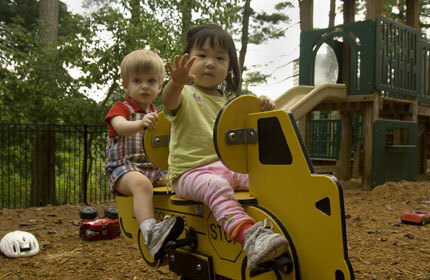 “We try to capitalize on kids’ natural curiosity, teaching social skills as well as age-appropriate play,” says Sharon Hynes, who coordinates the Emory Autism Center’s early childhood programs. The center, which opened in 1991, is part of the Department of Psychiatry and Behavioral Sciences and has become a national model for the diagnosis and treatment of children and adults with autism spectrum disorders. Also known as pervasive developmental disorders (PDD), these include autism, PDD-Not Otherwise Specified, Rett syndrome, childhood disintegrative disorder, and Asperger syndrome. Children with autism make up a third of the students who attend the Walden Lab School at the Autism Center, located in a large brick building on Emory’s Clairmont Campus. The remaining students are “typically developing” children, without disabilities or delays, who serve as peer models. Visitors are able to observe from behind large windows that look into each classroom. From the durable tables to the activity centers stocked with books, stuffed animals, and puzzles, the lab school resembles every other high-quality preschool. But behind every similarity lies a strategic intent. Tiny portions of drinks and snacks—on this summer day, grape jelly on crackers and small plastic cups of milk—coax the students to ask for seconds, which encourages interaction and language use. When a toddler refuses to pick up and put away a game she has left on the floor, the teacher places her hands over the girl’s hands and redirects her, picking the toy up and returning it to its place. Although the lead teachers in each classroom have bachelor’s degrees, many of the staff are Emory students or interns. They are a young, energetic group with more men than are usually found among preschool teachers. Autism is a developmental disorder ranging from mild to severe that appears during the first three years of life. Children with autism tend to exhibit difficulties in verbal and nonverbal communication, social interactions, and play; they may rock in place, seem “in their own world,” and avoid eye contact or touch. Four of five autistic children are boys. In the 1970s, about four or five in 10,000 children were diagnosed with autism; now, it may be as high as one in 166 children, according to the Centers for Disease Control and Prevention (CDC). Parent groups who suspect that mercury in childhood vaccines accounts for some cases of autism have received considerable attention in recent years, but scientific evidence of a link has not been established. Some studies have shown that high levels of mercury in the environment correlate with high levels of autism in the area. A genetic component has been established through twin studies—in identical twins there is about a 75 percent rate of both twins having autism, while in fraternal twins, this rate is about 3 percent. The fact that identical twins do not share the disorder in all cases, however, points to multiple causes. A recent study has shown that men older than forty have a higher chance of fathering an autistic child. Part of the center’s mission is to investigate autism’s causes, indicators, and potential cures, and its staff partners with researchers from the departments of genetics, psychiatry, and psychology, as well as the Yerkes National Primate Research Center. Assistant Professor of Psychiatry Opal Ousley, for example, has done research on screening tools for autism in early childhood, possible biomarkers (physical indicators) of autism, and other genetic disorders associated with autism, such as Fragile X and 22q11 deletion syndrome. The center sees children as young as eleven months who are thought to have an autism spectrum disorder, although a follow-up diagnosis is recommended if the child is younger than three. In general, the younger the diagnosis and earlier the treatment, the better the outcome. Walden Lab School has proven highly effective in preparing its students for inclusion in public schools—more than 90 percent of its graduates with autism have been transitioned into local kindergarten classrooms (with various levels of support) and more then 92 percent exit the program with functional verbal skills. Faber drives more than eighty miles each way from the family’s home in Ellijay, Georgia, five days a week, to bring Andy and his sister, two-year-old Irena, to the preschool. The philosophy of educating children with autism has changed dramatically in the last ten years, from keeping autistic children in separate settings with specialized teachers to immersing them in as normal a life as possible, at home and at school. “Many children with autism are left to sink or swim with no support in school. In that case, they almost always sink. We want to make sure that doesn’t happen,” says Sheila Wagner, assistant director of the Autism Center and coordinator of the center’s MONARCH school-age program. The center’s tutoring program offers individual instruction in reading decoding and comprehension, written expression, math skills, and social skills; teacher training workshops are held during the summers. In its family training program, the center offers hands-on, practical instruction to parents and other family members, taking trips to grocery stores and simulating a home environment. When working with autistic adults, the center enhances social skills through support groups. “Our group members often feel as if they’ve missed out on friendships and just ‘hanging out’ with people. They want that, but they don’t know how to keep it going,” Thomas says. “We’ve had poker nights and Mary Kay parties, we’ve gone to coffeehouses for games and activities. Just having people celebrate their birthday as a group means a lot to them.” —M.J.L.